Star Wars has a long history of merchandising everything, right down to the characters you see in the movies for mere moments. Who doesn't remember heroes like Toryn Farr, Willrow Hood or Yak Face (apologies, Saelt-Marae)? Now even characters seen for literal seconds are getting the Hot Toys treatment. See those wee little fellas, on screen for the cinematic equivalent of the blink of an eye? Not even they can escape the power of the Force Merchandising. 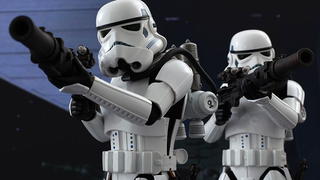 Hot Toys have taken the opportunity of the upcoming Star Wars Celebration to sell the Spacetrooper as a fancy convention exclusive for fans attending. An exclusive pointing finger, so you can pose the wee fella doing the only thing we ever see him do on film. They did it. They did the thing, everyone. Pack your bags, go home, etc. 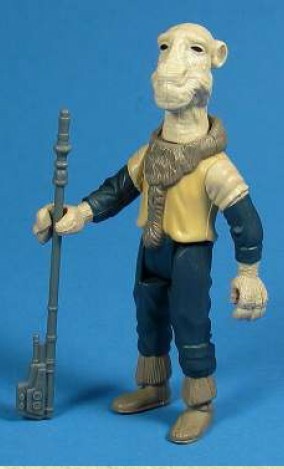 This is the most ridiculous, wonderful commitment to a short-lived background character in Toy history. The Spacetrooper is exclusive to Star Wars Celebration for now — if you're attending, it'll presumably set you back the same price as the Stormtrooper does, around $200. Hot Toys imply they'll open it up for preorders at a later date, so maybe don't go hunting down priced-up versions on eBay if you're not going.